My slogan is: inherit the excellent tradition of Chinese art, cultivate unique personal creativity and aim for the development of splendid modern Chinese shuiyin (water-soluble colour printing) woodcut printmaking. Zhang Xinyu began to publish his woodcuts when he was 15 years of age. From 1951 to 1958, he studied at the Huadong branch of the Central Academy of Fine Arts in Hangzhou (now called the China National Academy of Fine Arts). 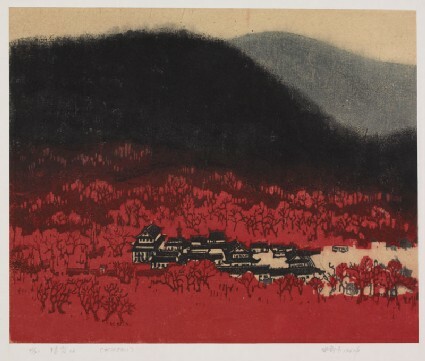 For nearly four decades from 1960, Zhang worked at the Jiangsu Printmaking Institute as a professional printmaker (later he became the head of the Institute). 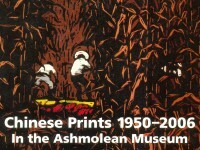 The modern water-soluble colour woodcut was initiated in Jiangsu province during the 1960s. Zhang was one of the main printmakers to incorporate traditional Chinese printmaking skills to form a distinctive effect in order to reveal the delicate and beautiful views of the landscapes or cityscapes of south China. Mount Qixia is located in the northeast of Nanjing, and is well-known for both its Buddhist heritage and its autumn maple leaves. In this print, red both reflects the natural beauty and has political connotations. The Qixia temples were largely destroyed during the Cultural Revolution several years after this print was created. Zhang Xinyu is one of the main printmakers to incorporate traditional Chinese printmaking skills, creating a distinctive effect that highlights the beauty of the landscapes and cityscapes of south China.